Mac OS X Yosemite 10.10.2 Beta 6 (Build: 14C106a) has been officially seeded by Apple to all OS X developers and non-developers (general users) for updation / upgradation / installation for experimenting and testing of various features, functions and applications. 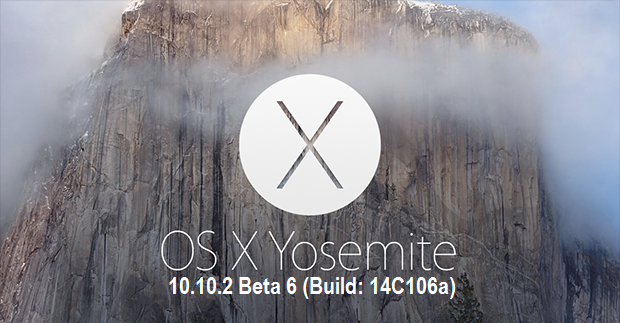 The Direct Download Links of OS X Yosemite 10.10.2 Beta 6 Update .DMG File has been posted below. Apple has brought several new changes and additions in the latest available beta released, According to official changelog and release notes of OS X 10.10.2 Beta 6 (14C106a) it contains; Fixes of Bugs, Bluetooth, Voice Over, Mail and Wi-Fi improvement and stability fixation. How to Install OS X 10.10.2 Beta 6 Manually? You can automatically update to the latest available OS X Yosemite 10.10.2 Beta 6 (14C106a) via Mac App Store >> Software Update option. All Mac OS X developers can go to OS X Dev Center website for official OS X 10.10.2 Beta 6 Downloads. All Mac OS X non-developers (general public) can download, install and activate OS X 10.10.2 Beta 6 without Apple UDID and developer account for FREE via iTunes, after downloading files from below third-party links.